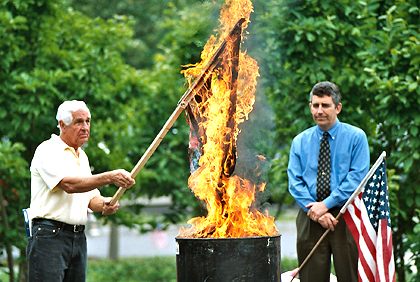 RETIRING OLD GLORY: Borough residents Ray Wadsworth, left, and Mark Freda decommission the first of an estimated 1,000 flags last Thursday at Princeton Township Hall at the Spirit of Princeton's annual Flag Day ceremony, where aged and worn flags are burned and formally retired. Also in attendance at the event were members of Princeton Township Committee, the Princeton Fire Department, and the Princeton First Aid & Rescue Squad. Spirit of Princeton, a community group that heads up the annual Memorial Day Parade and the Veterans Day ceremony, will next sponsor the Independence Day fireworks on Monday, July 2, on the playing fields adjacent to the Princeton Stadium. The state Senate's Budget and Appropriations Committee Monday gave a unanimous nod to a bill that could spell a major victory for Princeton Borough, which has navigated legislative waters in an effort to keep a privately owned Princeton University eating club on the tax rolls, by amending the rules for state historic site designation. Hillier Architecture, the 41-year-old architectural design firm begun in Princeton and now headquartered in West Windsor, announced Tuesday that it has merged with the U.K.-based RMJM, resulting in what is now positioned to be the third largest design firm in the world. Princeton Public Library's community room lived up to its name Saturday as a community-based group got together to discuss all things related to development  from pie-in-the-sky projects, to massive developmental undertakings currently in motion, to projects so modest they could only upset a next-door neighbor. Nonetheless, dozens showed, and everyone had something to say. Band director Joe Downey introduced Princeton High School's award-winning Studio Band to a full house in the Trego-Biancosino Auditorium last Saturday, June 16. Princeton Regional Board of Education held a special meeting on Tuesday, June 12, in the John Witherspoon Middle School. Princeton Borough Council last week got its first taste of a rezoning effort that will result in the likely redevelopment of nearly 30 acres of fertile land that abuts not only the Borough's commercial district, but also two neighborhoods that are in close proximity, but different both culturally and economically. Establishing himself as one of the top schoolboy baseball players on Staten Island, Sal Iacono naturally harbored dreams of someday becoming a pro player. A thunderstorm bombed the Bronx last Saturday afternoon, interrupting the proceedings as the Yankees hosted the Mets in the latest installment of their annual Subway Series. Scott Goldsmith had high hopes coming into this spring in his debut season as the head coach of the Princeton High baseball team.